In 2011, the City of Cheney Parks and Recreation Department wanted to take their community-wide coalition building activities to the next level. Weighing national interest in working in this small college city, they selected Adam Fletcher through a competitive bidding process to develop the Let’s Move, Cheney Five-Year Strategic Plan. Faced with an epidemic of childhood obesity in their city, Cheney leaders gathered together to address the issue through a community-wide initiative focused on transforming systems, cultures, and attitudes towards health and wellness in the city. However, after a year of working together, diverse perspectives revealed the need for an outside facilitator who could establish middle ground and build consensus on moving forward. Focusing on creating a comprehensive long-range plan, Adam’s contract included creating a performance measurement tool, a community engagement plan, an action plan, a fundraising plan, an annual evaluation plan, and a sustainability plan as part of the effort. He conducted almost 100 key informant interviews; facilitated group feedback sessions; and devised the final copy for the plan. Additionally, Adam also facilitated a community-wide meeting with more than 70 participants to deliver the plan. In the 2011-12 school year, I designed and facilitated the King County Youth Engagement Practitioners Cadre for Seattle Public Schools in partnership with Kyla Lackie of SOAR in Seattle. This included facilitating 28 hours of professional learning community activities for 25 diverse King County youth workers, developing curriculum, providing reports, and presenting findings at conferences. In summer 2012, I provided technical assistance and contract supervision for the Seattle Youth Media Camp. This two-week course included 80+ hours of instruction for 20 students of color from a low-performing high school. They produced a video and received credit from their school for attending. In 2012-13, I again partnered in designing and facilitating the Cadre. Additionally, I presented on the Cadre and the Zone in several settings, including the National Service Learning Conference in Denver, Colorado in March 2013. All activities were funded through the Corporation for Community and National Service Youth Engagement Zone grant to Seattle Public Schools, operated by Service Learning Seattle. SOAR is the King County collaborative for children and youth. In addition to facilitation, I edited the summary publication of the Cadre, The King County Youth Engagement Handbook, and sat on the Service Learning Seattle Advisory Board. This is a promotional flyer for Imagine Miami with Adam Fletcher. 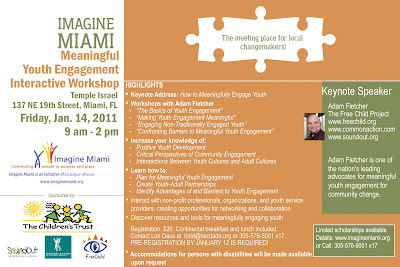 Learn more and register for this event at the Miami/Dade County Human Services Coalition website. In 2009, Adam began consulting Helen Beattie in Vermont, where she has carefully created a powerful program called Youth and Adults Transforming Schools Together (YATST). Over the last three years Helen has worked with a variety of organizations and high schools to develop a this effective model of school transformation that closely reflects my Frameworks for Meaningful Student Involvement. Seven high schools participated in YATST, with several more joining this year. Later, Helen’s colleague Jean Berthiaume contacted Adam to share YATST and some of the challenging work Jean is engaged in as a Rowland Fellow. Working as a social studies teacher at Harwood Union High School, Jean has been deeply engaged in the work of effectively fostering and shepherding student voice towards full partnerships for many years. His wisdom is awesome, and his experiences learning from his peers and engaging students as partners make for wonderful storytelling. After several long conversations with Jean, and his generous introduction of Helen, they came to visit Washington in October, 2009. For their tour, Adam partnered with my longtime colleague and youth voice and action ally Greg Williamson, who is the director of learning and teaching support at the Washington State Office of Superintendent of Public Instruction. We excitedly showed Jean and Helen around Western Washington, introducing them to Carole Layton, a teacher/hero of mine who has worked long and hard at Black Hills High School in Tumwater to promote student engagement. Our group met with Mark Perry, principal at NOVA High School in Seattle to scan the awesome work- only to have him direct us straight to students we met in the hallway to talk about their experiences! It was awesome. We also met with Claire Buddeke, a student at The Evergreen State College formerly of the Washington Legislative Youth Advisory Council. She freely shared her experience with youth/adult partnerships, particularly in state government, and told Helen and Jean a lot about Evergreen, as well. After that spectacular occasion, Helen and Jean invited me to Vermont to learn about their work and share my information about meaningful student involvement. Among the many, many awesome things they shared with me there, Adam had the opportunity to facilitate at the annual Youth and Adults Transforming Schools Together gathering. IT WAS AWESOME. Seeing so many youth and adults willing to work together, digest and make sense of the challenging information Adam was sharing, and trucking through all that together and doing wonderful things afterwards was great. Adam wholeheartedly and fully suggests to anyone wanting to learn how to do meaningful student involvement to learn more about YATST. Visit their website at http://yatst.com/, and if you get really into it and want more information contact Helen Beattie by calling 802-472-5127. Very cool! Students ARE Changing Schools RIGHT NOW! This month saw the opening of an exciting new partnership between CommonAction Consulting and Seattle Public Schools focused on their brand-new Youth Engagement Zone project. Funded by the Corporation for Community and National Service, we will be provided technical expertise on youth engagement to a variety of partners in the project. After providing preliminary support to Lois Brewer, the project coordinator, Teddy Wright and myself (Adam Fletcher) will be facilitating our first activity in the partnership in December in the form of a training for local police focused on youth-adult partnerships. Stay tuned as we move forward – and check out this excellent article that came to us via our ally CB Smith-Dahl about a powerful new project in Oakland, California that is engaging youth as researchers focused on relations between youth and police. Adam consulted the Student Engagement Initiative at the Alberta Ministry of Education in Edmonton from 2010-2012. Teaching the Ministry staff about his Frameworks for Meaningful Student Involvement, Adam consulted adult partners on next steps and possibilities for the initiative. Adam wrote an extensive student engagement research review for the Ministry, and detailed international best practices for them from the US, the UK, and Australia. In 2011, Adam keynoted at the annual SpeakOut Conference for 700 students, teachers, administrators, and Dave Hancock, the Minister of Education. As a consultant to the national nonprofit Action For Healthy Kids from 2008 to 2010, Adam Fletcher coordinated a statewide youth-led action program in Washington state focused on youth improving nutrition and physical activities in K-12 schools. Providing training, technical assistance and program support for 12 high school teams based around the state, Adam’s leadership in this two-year project included a variety of actitivies. They included social media management with more than 1,000 messages in 22 months; two dozen student-created school advertising campaigns; administering $20,000 in grant funds, and other efforts focused on building the ability of local schools to engage students in healthy lifestyles. The national organization also contracted Adam to write a proposal for a national youth advisory board, and to provide speeches at state and national events. Students Taking Charge culminated with student-led events in several communities. For his leadership in this program, Adam was awarded the “Healthy School Champion” award from National Action for Healthy Kids by former U.S. Surgeon General David Satcher. From 2006-10, Adam supported the national nonprofit Youth On Board as they continued and expanded their efforts to promote systemic youth engagement in Boston Public Schools. He also rewrote two of their publications, 15 Points to Successfully Involving Youth in Decision-Making and Youth On Boards. Adam partnered with Youth On Board (YOB) to provide resources and develop case studies focused on the Boston Student Voice Project. Working through the district Office of High School Reform, YOB facilitated the Boston Student Advisory Council for three years to that point. They also coordinated the district-wide Student Engagement Advisory Council (SEAC). YOB assisted with the development of small learning communities in the former Hyde Park High School by facilitating a strategic student voice plan in the school. SoundOut supported these efforts in an ongoing basis with technical assistance and critical evaluations.